valentine’s day was yesterday. it was our first as a married couple! 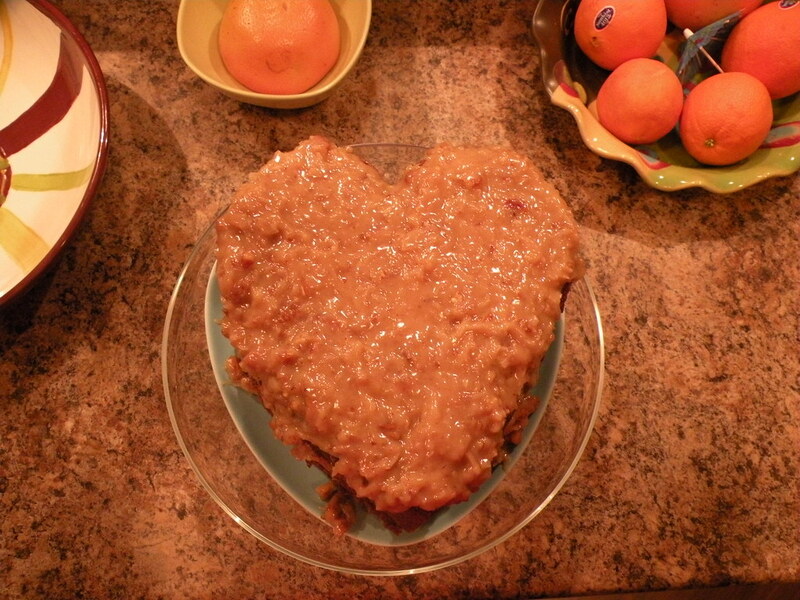 to commemorate the day, i baked my hubby a heart-shaped german chocolate cake, one of his favorite desserts. preheat oven to 350°. cover bottoms of 3 9″-round cake pans with wax paper; grease sides of pans (i used pam with flour in it). microwave chocolate and water in large microwaveable bowl on high 1 1/2 – 2 min. or until chocolate is almost melted, stirring after 1 min. stir until chocolate is completely melted. beat butter and sugar in large bowl with electric mixer on medium speed until light and fluffy. add egg yolks, 1 at a time, beating well after each addition. blend in melted chocolate and the vanilla. add flour mixture alternatively with the buttermilk, beating until well blended after each addition. bake 30 min. or until toothpick inserted in centers comes out clean. immediately run small metal spatula around cake layers. cool in pans 15 min; remove layers from pans to wire racks. remove wax paper. cool cake layers completely. spread coconut-pecan filling and frosting between cake layers and onto top of cake. add coconut and nuts, mix well. cool. This cake was awesome…. it still is! !